I have two lists that are related. I am trying to display them with a CQWP but I never used it. How can I list the items from the parentlist with its child items? Querying content is based on a keyword matching defined in your CQWP's properties which is the place where you define the query. 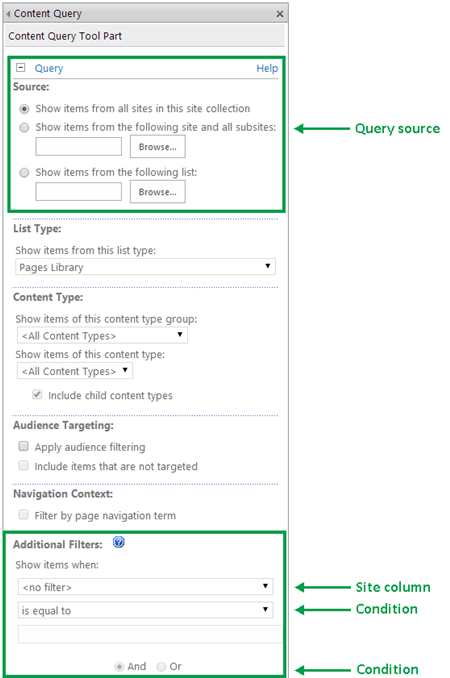 This means that the CQWP will only show the items which match to your query. Considering that your lists are probably located at the same place, you need to define 1. the location where to query and 2. the matching keyword which is constructed from the properties of the list items. If you have your lists in e.g. the same site and there are and will not be any other lists, you may just query every list of your site. If there are or may be in the future other lists, you need to define some common property which the items of the lists share. Typically this would be a metadata (e.g. a column [PIR] with a value 1 or Yes or whichever feels natural) or a shared site content type. Other options include a shared content type group or a list type. Not the answer you're looking for? Browse other questions tagged list-view content-query-web-part linked or ask your own question.